Posted November 26, 2018 by Roxanna Brock McDade & filed under Driving to Mexico. Chaotic cities! Dirt roads! Burros running wild! First-timers anticipating difficult driving conditions in Mexico usually discover that their fears are unfounded, and they’re probably even quite embarrassing in hindsight. No, maintained roads don’t disappear the moment you’re south of the U.S. border. And city streets aren’t completely chaotic… Of course there are quirks, and it’s best to learn the road rules and local conventions before you get behind the wheel. For a start, you’ll want to know the following things that you might not find on the road in Mexico. Put another way, there are things you won’t encounter on the road in Mexico that will make your trip much more memorable. OK, you might see drivers rushing through yellow lights at Mexican intersections. But, know that it’s illegal to do so. So let’s rephrase…you’ll never encounter sensible drivers rushing through a yellow light in Mexico. And once you’re used to driving in the country you’ll notice that sensible drivers are a lot more common than lunatics. As a visitor, it makes sense to follow the yellow-light rule to a “T,” along with every other rule of the road. While gas stations throughout Mexico (the majority are Pemex stations) have bathrooms for customers’ use, there are no rest stops of the kind you see along U.S. and Canadian highways. You also won’t come across many fast-food restaurants or other roadside conveniences. Plus, most roads do not feature a hard shoulder suitable for pulling over if you need to make a stop. When you need to use a bathroom and there’s no gas station close by, you might need to stop at the next town or village and find a local restaurant. If you think upright, easy to see stop signs will alert you to upcoming intersections, take a closer look. The signs may not have reflectors like U.S./Canadian signs and may be positioned at a much lower height. So keep an eye out, especially at night, before whizzing through those intersections. Mexico uses the metric system, so gasoline is in liters, distances are in kilometers and speed is therefore measured in kilometers per hour. So, remember while you’re driving in Mexico that posted speed limits and distances refer to kilometers and the speed indicator on a Mexican rental car’s dashboard represents kilometers per hour. If you’re driving your own car from the United States or Canada, your indicator might show both mph and km/hr. If it doesn’t, prepare to perform some quick mental arithmetic (1 km equals 0.6 miles) to translate the speed on your dashboard. Consider memorizing the equivalents of common speed limits e.g. 60 km/hr is equal to 37 mph and 100 k.m./hr is 62 m.p.h. 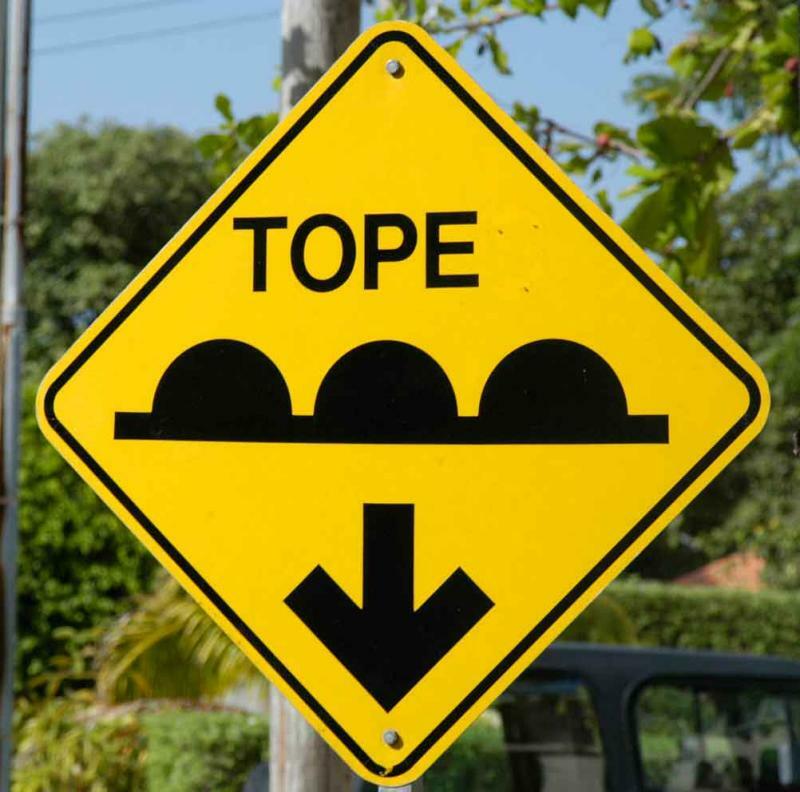 Topes, or speed bumps, are ubiquitous on Mexican roads. Many are marked by signs – look for a bump motif or the word “tope” or “reductor de velocidad” – and/or painted lines on the road. However there are many topes out there with zero warning signs, which can cause quite the jolt to an unsuspecting driver. There’s also no consistency in the height of topes. It’s all the more reason to take it easy on the gas pedal and keep your eyes on the road. Mexico has an amazing service set up to help visitors who are having trouble on its roadways – the Ángeles Verdes (Green Angels). These are teams of bilingual assistants employed by the national tourist office who patrol major highways throughout Mexico, coming to the aid of motorists in need. True to their name, they’ll make minor repairs, replace flat tires, arrange towing, provide you with maps and restore your faith in humanity. Best of all, the service is free of charge (parts are provided at cost). Note the hotline number – 078 – in case you need a visit from the angels. 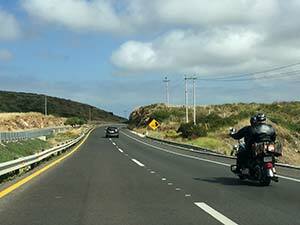 Unaccustomed drivers can certainly expect some surprises on Mexican roads, and you’ll never be fully prepared for the experience until you get there. Keep an open mind and positive attitude, and you’ll find those surprises are often of the nice variety.